FUN AND PLAY WATER FOUNTAIN by Cascading Fountains home decor, jewelry, decor, decorations, electronics, fountains, floor mats, art glass, vases, garden essentials, fireplace screens. Whats more refreshing than a cool drink on a hot day? 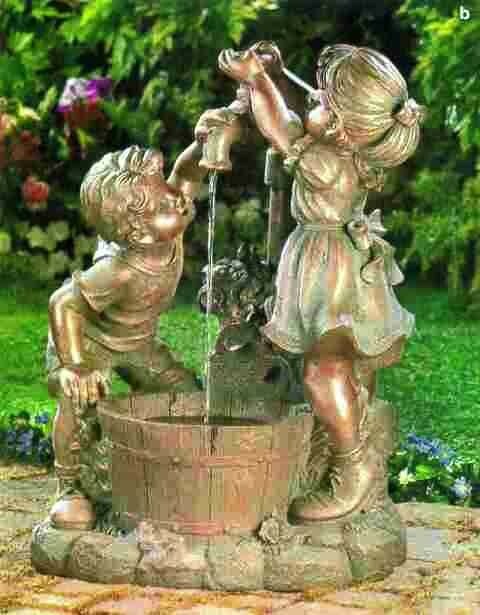 Beautiful bronze-look fountain shows two children at innocent play in the garden. Weathered finish adds instant antique appeal! Outdoor use only. Due to the size and weight of this item, we are ONLY able to ship it within the Continental United States, to physical address locations, and only via UPS Ground. Shipping to Canada is available. Material(s): POLYRESIN. Weight 30 pounds. Dimensions 19.6" x 14.4" x 26.1".